National Agriculture Day’s official ambassador, George the Farmer, has released a brand new story book in the award-winning George the Farmer series. George the Farmer is Australia’s best-loved farming character. 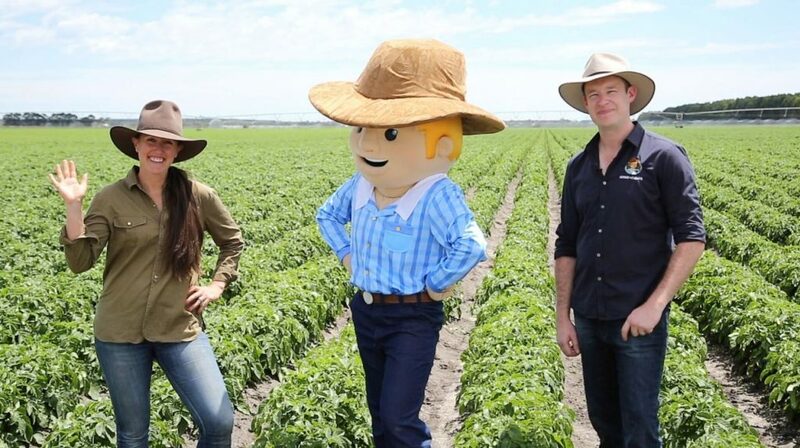 Since he was first launched in July 2014 as an interactive story app, the George the Farmer brand has gone on to delight and educate many kiddies and adults alike all over Australia – and further afield – about agriculture. George the Farmer with his creators Simone and Ben. When Ruby smells smoke while George and Jack are harvesting, hopes of a successful broad bean crop harvest are almost extinguished. Fifty cents from the sale of all George the Farmer Australian made books are put towards creating free curriculum-aligned agricultural resources for pre-school to year four. Click here to purchase this book, or receive 10% off when you purchase the entire collection.